The above information is presented by the Biro Reception Study in the following formats and segments. 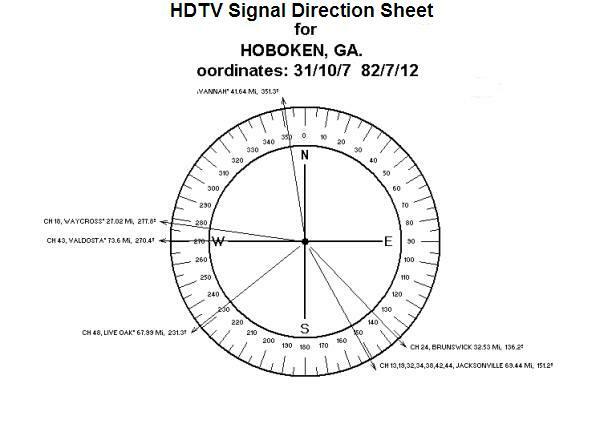 All Jacksonville analog and HDTV UHF stations, Channel 17-19-30-32-34-38-42-49-59 are received from the same direction. The application of high gain parabolic antennas is strongly recommended. The same technique should be applied to receive CH 15-22-23-27-28-38, Savannah, Ga.
To demonstrate our flexibility, here is the same 80 mile radius computer run, displaying only HDTV stations. Observe the large variation in HDTV output power. 1000 kW for Channel 19, Jacksonville, but only 50 kW for Channel 43, Valdosta, resulting in a 20 dB reduction in the project signal level. The second segment of the computer-run focuses on co-channel interference possibilities. 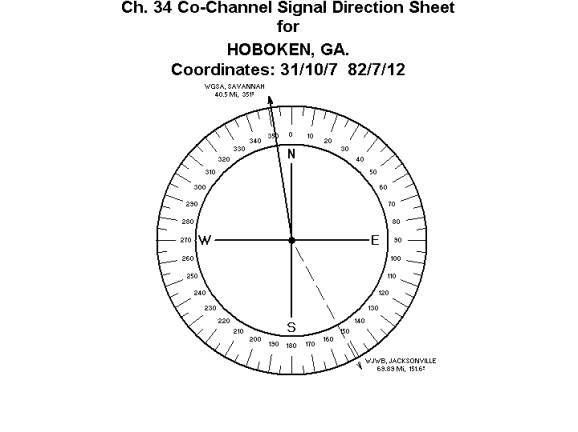 The search is available for every VHF and UHF channel, covering a 400 mile radius. The co-channel interference print-out for Channel 13, WTVV, Jacksonville displayed all potential offenders in increasing distance order. 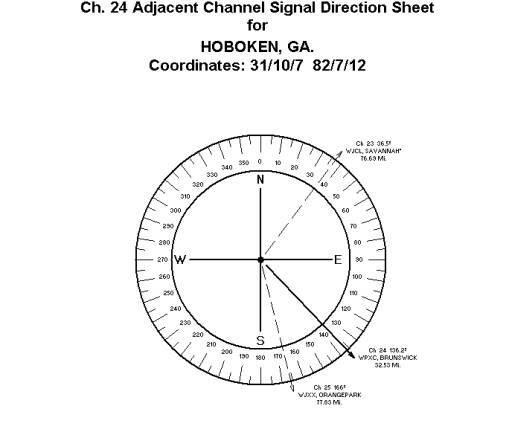 The dominant interfering station, Channel 13, Savannah was found at almost the same distance as the desired,. indicating a potential interference situation. In this case the installation of a custom-tailored phased-array seems mandatory. The objective of the computer developed SIGNAL DIRECTION SHEETS is not to promote artistic quality or advances in computer science. Signal Direction Sheets present the Compute Run’s technical information in a convenient visual format, helping the on-site verification testing of co-located stations, assisting the survey engineer during the on-site verification testing. The search for the desired and undesired (interfering) stations will be performed faster and with greater accuracy. To focus on co-channel interference conditions, demonstrating analog and Digital TV interference possibilities for any selected channel. 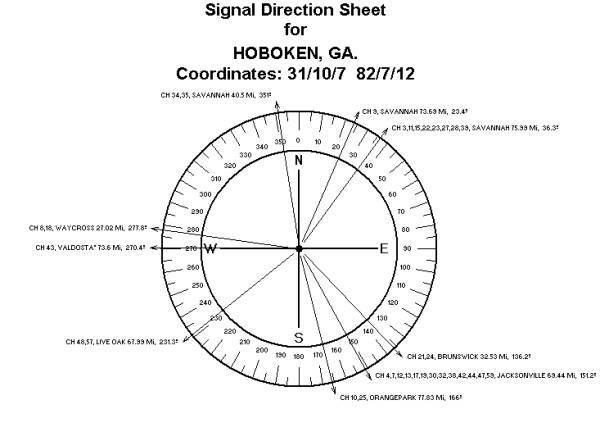 Note that all Jacksonville stations to be receive from the same direction, while. the Savannah stations arrive from three (3) different directions. All Jacksonville HDTV stations received from the same direction, offering a single antenna solution. A potential Channel 34 co-channel interference situation demonstrated by the Signal Direction Sheet above. The reception of Channel 24, WPXC-DT, Brunswick may not be absolutely free of adjacent channel interference, arriving from two directions. It is time to move into the 21-st century with computer based, fast and comprehensive data search programs. The results (literally) just a click away. The study can be sent electronically via the Internet to your desktop in minutes, not in days or weeks, or in a more traditional delivery form, the printed version by FedEx, arriving the next morning. It is true that other (free) TV reception studies are available on the WEB. But there is no comparison in the wealth of information and particularly special signal direction sheets, coming very handy during an on-site signal survey. Biro Engineering is not sponsored by the Ford Foundation, the study is not free. Quality technical services require reasonable compensation. Receiving antennas of proven quality and performance. Computer aided studies cannot detect or project interference, generated by high-voltage transmission lines, power-line transformers, mobile radio services, vehicular and airplane- traffic, CB radios, second harmonics of FM stations, and last but not least ghosting. Costly mistakes can be avoided by verifying the projected signal levels and possible interference conditions at your tower site. Biro Engineering offers cost-effective on-site signal verification surveys, providing factual signal level and picture quality information of the desired channels, as well as identifying co-channel, electrical, RF interference and ghosting difficulties. An antenna bill of material and tower sketch is an integral part of the Biro Study.